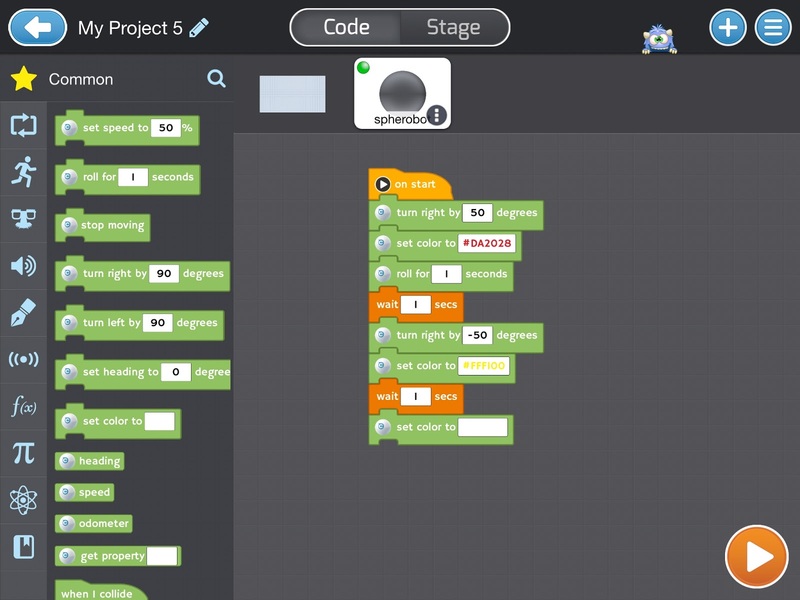 Creative Computational Thinking: Have a Sphero BB-8 - now what? Previously I have shown the Sphero BB-8 rolling around the room under its own control, under the control of Sphero's own software - which has some fantastic features, I especially like the Augmented Reality message replicating the holographic projection in the film. At the time of writing (27th December 2015) this was number one best selling robot toy and 14th best toy overall in Amazon.co.uk toy list that day. The video below is the Sphero BB-8 Droid on patrol one of the options in the App. But what is you want to take it a little further? What if you bought it and now want to program it? One of the features of this device is it is programmable; and there is more than one option, two are presented in this post. First option, by one of my favourite apps - TickleApp which has been discussed in previous posts. 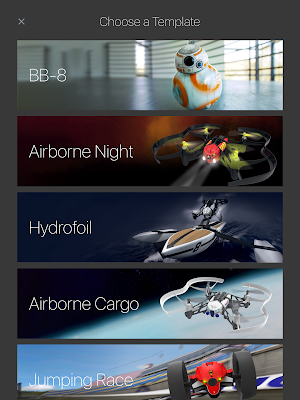 This app allows control of a quite an impressive range of devices using the same interface. 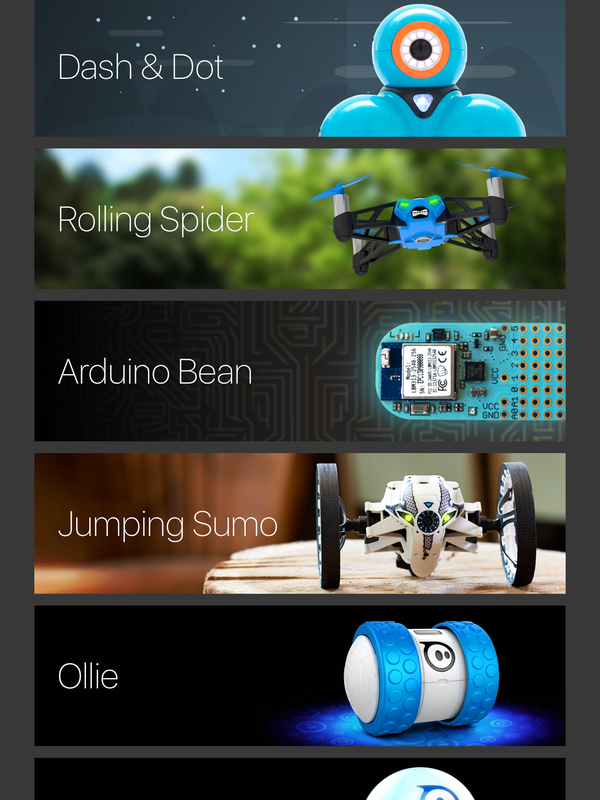 Examples, some of which have been discussed previously (e.g Parrot Minidrone or Dash and Dot), are shown below - including Sphero BB-8. If the BB-8 collides (or is bumped) it is set to spin twice for a second. 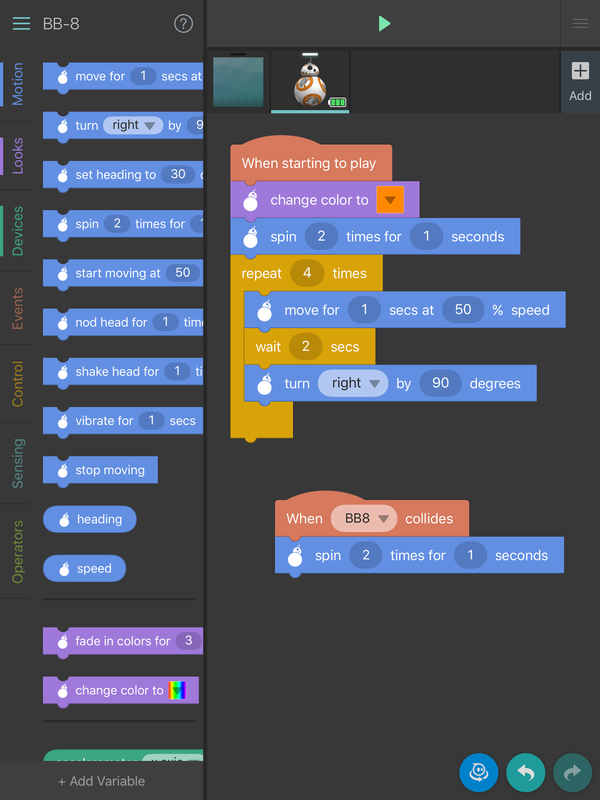 Ok, not the most sophisticated bit of coding; but it does demonstrates the simplicity of controlling this robot with the app. BB-8 is great fun, and with the head appearing to float over the body and facing in the direction of movement it is hard resist. The video below shows it action. The Tickleapp is not the only alternative software, the Tynker App can also control it. This is also a graphical drag and drop programming tool, that you can connect certain 'toys' to. Though the App, like Tickle, is mainly concerned with developing programming skills, the ability to add physical device is an enhancement. You should get a screen with some code for changing the colour shown and then moving in a square- you can change this for your own code. Not all the commands, listed down the side, will work with the BB-8 - I restricted myself to the ones under common (star in the list). The Tynker app is a nice tool anyway with lots of games related activities to try. Having the ability to connect and program certain devices is a benefit. Personal note, if you have one of these toys I would say give programming them a go. 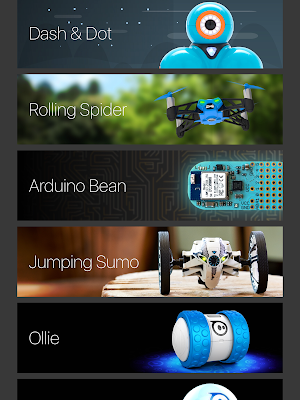 If you have comments or experiences with Tynker, Sphero BB-8 or Tickle app please add them to the comments below.